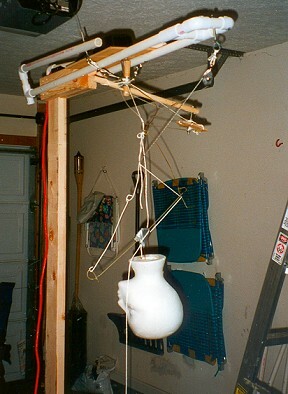 Desperation construction turned a wobbly PVC skeleton into a heavy-duty gallows you could do chin-ups from. Using coat hangers and the usual styrofoam head (which we accidentally melted), Joe hung up the marionette for a test run. I wasn't there personally to witness the event. However, before the FCG committed suicide, it's disturbingly evocative motion was described by my brother as, "someone trying to scratch the middle of his own back. Underwater." 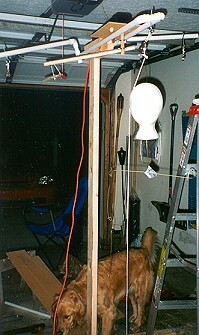 Pictured at right is the result of the first test. How Joe kept from tying the thing to the bumper of the Explorer and taking it for a trip down the street is beyond me. 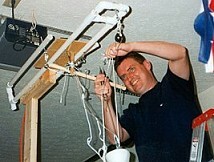 After cheerfully cutting away three feet of knotted string from the crank arm and pulley system, Joe began weighing his options. 1. Load the thing up in the truck and dump it in brother Bill's driveway. 2. Drink until November rolls around. 3. Drink until the styrofoam head has some ideas.